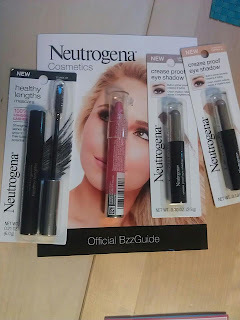 I'm Not Skinny: Neutrogena Cosmetics has a new friend in me. Neutrogena Cosmetics has a new friend in me. I am really WOWED by these products. I love makeup, I love painting on a pretty face and starting off my day. Some people don't like it, I do. That being said I'm also not a fan of it taking me anymore than about 5-10 minutes to paint my face. I've got other things to do, coffee doesn't make itself in my house! These products have turned out to be really great for quick application they really do last all day and aside from one product claim that I'm still a little skeptical about they work FANTASTIC. What came in my BzzKit? The Neutrogena Crease Proof Eyeshadow sticks are amazing! They go on so evenly, smooth and are safe for sensitive eyes. They really are 12 hour crease proof and remove easily. I love these, I will continue to use them and purchase them and would encourage anyone who likes a quick easy beauty routine to do the same. The Neutrogena Moisture Smooth color stick is pretty fantastic as well. It goes on easily, adds moisture and the perfect amount of sparkle. Now my lips are pretty worn from the icky winter months, so I decided to test out this claim of softer lips in just 3 days. My lips are improved, much improved. I would absolutely recommend this product. The Neutrogena Healthy Lengths Mascara makes a big claim. 100% longer looking lashes. I have really light lashes, so I guess they win that round? However, I don't feel like my lashes looked longer compared to my regular mascara. I won't be replacing it for this is what I'm saying. That being said, I love the brush, and it is safe for sensitive eyes and contact wearers. Just a little before and after. Only using the products listed. Close ups again only using the Neutrogena products. I want to disclose that I'm a BzzAgent. What is a BzzAgent you may wonder, I shall tell you. Because I am a member of BzzAgent I often get to try new products in exchange for my honest feedback about the products and to help create word of mouth buzz for those products. In a nutshell the products I just reviewed I did get for free, however all opinions on them are my own honest opinions. Side note: Go join BzzAgent. I might try that crease proof eyeshadow for the few times I wear it. I would get it in a white and a gray if they have it-makes for dramatic looking eyes! I like your eye make up. I don't have the talent with make ups but admire those who does, like you! Looks great. Gotta love Bzz Agent for letting you try new things before you buy them. How cool! I love Bzz Agent and Neutrogena products! They have some great stuff! !